Show your special someone that he or she is in your thoughts with this gorgeous single, long stemmed Rose. 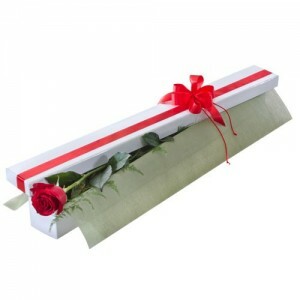 Delivered in a classy presentation box, it will be a sure way to impress today tomorrow or on Valentines Day. If you wish to make a fantastic impression, may we suggest that you add the Superior box of chocolates and a 45cm Helium Balloon and let your special someone take pleasure of enriching all the senses, sight, touch, smell and taste!